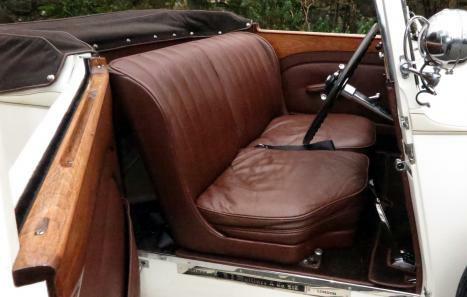 A very unusual and particularly desirable, compact, sporting, two seat coupe with dickey seat in the rear. Some may refer to it as a roadster. 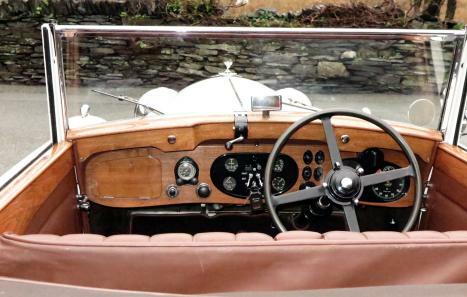 Appealing features include attractive 'trouser crease' wings, an impresive array of lamps, horns and badges, a neat & nifty hood, which looks good when up and folds nicely low when down, lovely toolkits built in to each side of the rear compartment, etc, etc. One of very few built to this configuration, and having been subject to a major restoration in the late 1980s/early 1990s, the car is very sharp, with excellent paint, upholstery, chrome, hood, etc, etc. It is as clean underneath as on top! Has been with long-term owners in the USA, where the car was an award winner at the 2017 Greenwich concours. 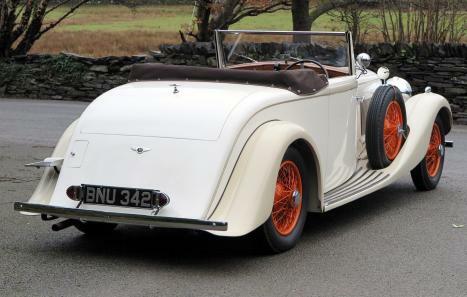 It is now back on British soil and on its original UK registration number. 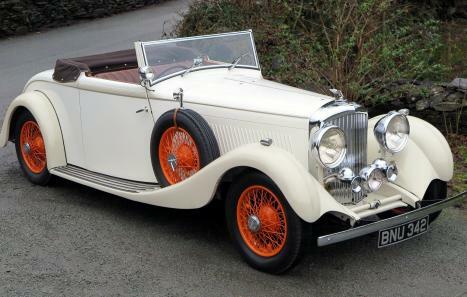 According to some early Jack Barclay records we have from the 1940s, the car was painted 'Mole' and was fitted with Ace wheel discs, which we think may well suit the design nicely. B157CW was purchased by Sir Ian Walker 3rd Bt in the same year that his mother Lady Ethel (nee Okeover) died; Lady Ethel had the unusual situation whereby she was the step-daughter-in-law to her own sister!! This occurred as Maude Okeover was the 2nd wife of Sir Andrew Walker 1st Bt thereby making Lady Maude the step-mother of Sir Peter (2rd Bt) and when Ethel married Sir Peter Walker her sister Maude therefore became both Sir Peter’s step-mother and his sister-in-law! Sir Ian Walker was married to Dorothy Heber-Percy who through both of her parents was connected to the Percy family of Alnwick Castle, Northumberland. When Sir Ian ordered B157CW it was noted that all the correspondence was to be via Mr. E. Wiles of The Motor House, Osmaston Manor rather than with Sir Ian Walker. In 1955 Sir Ian inherited the Okeover estate from his uncle Haughton Ealdred Okeover and in 1956 the family name was changed by Royal Licence to the double barrelled surname of Walker-Okeover but Sir Ian did not move to the Okeover estate until 1962. The 2nd owner of B157CW was W. K. Neal, he was one of the 20th century’s greatest collectors & expert of antique fire-arms, in his collection he had over 2,000 fire-arms alongside his other rather unusual hobby of collecting railway telegraph insulators! W. Keith Neal published many books these subjects which are still used as reference books today. Neal’s collection of fire-arms included 18th century long-arms, a couple of canons, 17th pistols previously owned by Louis XIII (1601/43) and a pair of miniature gold inlaid pistols commissioned by Napoleon Bonaparte (1769/1821) to celebrate the birth of his son. In an article written about W Keith Neal his daughter, Diana, can remember her father using B157CW on their trips in search of railway insulators on various disused railway lines and on the way home, as a treat, they would visit the tea shops in Bath! It is not known when B157CW was sold by W. Keith Neal but in 1976 he relocated to Guernsey and B157CW was next heard of as being in California & Connecticut.